﻿ Each quarter, the Elks National Foundation publishes Heartbeat, a newsletter full of the latest ENF news and stories. We just wrapped up producing the spring 2011 edition, and wanted to see what happens between the time we hand off the files to the printer and when the newsletter arrives in your mailbox. Enter Envision Graphics. Our printer, John Schmudde agreed to take Development Manager Kate Keating Edsey and me on a tour of the plant that prints and mails Heartbeat. We drove for an hour in Chicago morning rush hour traffic until we reached the plant in Bloomingdale, Ill., but the long drive was worth it! When we arrived, we met Account Executive Dave Shanahan, who took us on a full tour. We started with the pre-press room, where the Heartbeat files are checked for errors and a printer proof, a preview of what the newsletter will look like when printed, is generated. 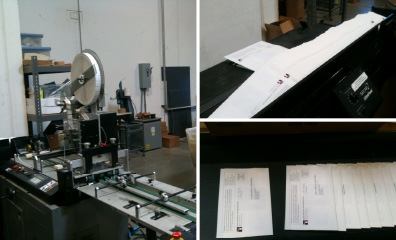 Printing the newsletter is just the beginning of the process. 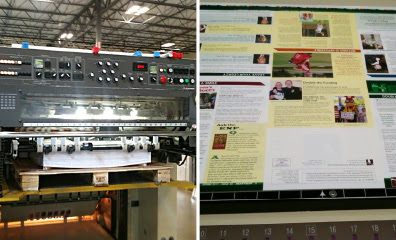 Heartbeat comes out of the press on large sheets of paper, two full issues per sheet, and is cut to size and folded. A binding machine sews a remittance envelope inside each issue. The newsletters then go through an addressing machine, where they are sealed, addressed, and made ready to go to the post office. A different person operates each individual machine. It was great to see how so many people played a role in printing and mailing this newsletter. Thanks to the work of Envision Graphics, the spring issue of Heartbeat will arrive in mailboxes soon! This is great stuff. Next I would sure like to see the plant where the pins are made.